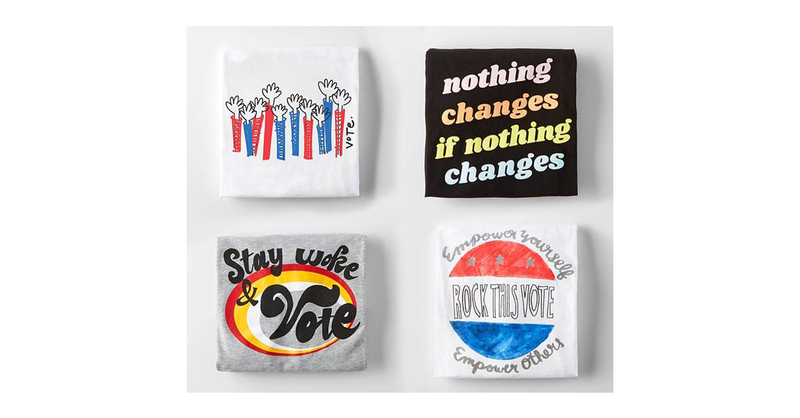 NEW YORK–(BUSINESS WIRE)–American Eagle (NYSE: AEO) announces its continued partnership with Rock the Vote through the launch of a limited-edition t-shirt collection, featuring four customer designs. A nationwide contest asked customers to create an original artwork that inspires them to speak up and make their voice heard. Designs by Nicole Fleisher, Kahlia Shearer, Alessandra Angiello and Hayley Fitzsimmons were chosen to be to be sold online at www.ae.com and in 262 American Eagle stores across the country beginning September 28. One hundred percent of sales will support Rock the Vote’s nonpartisan mission to build the political power of young people. Rock the Vote is a nonpartisan nonprofit dedicated to building the political power of young people. For nearly 30 years, Rock the Vote has revolutionized the way we use culture, music, art and technology to engage young people in politics, registering and turning out millions of young voters. During the last seven Presidential elections, Rock the Vote and its partners coordinated the largest voter registration drives for young people that added nearly 8 million new voters to the rolls and consistently turns out its voters more than 30 points above the national youth average. Rock the Vote fights for voting rights to ensure that all eligible voters can exercise their right to vote and promotes civic education to ensure young voters to have the resources and information they need to participate in our civic process. Learn more at rockthevote.org and follow us on Twitter, Facebook, and Instagram @rockthevote.